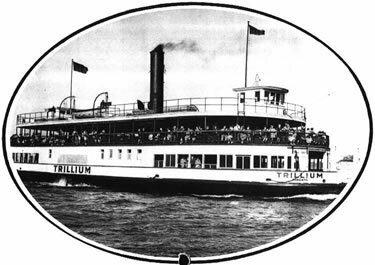 One of Toronto’s best known ferry boats, the Trillium, was built by the Polson Iron Works. The sister ship of the ferry boat Bluebell, the Trillium was launched on June 18, 1910 and saw her first day of service on July 1st, which was then called Dominion Day. The Trillium was a large ferry boat, created to increase passenger service from Toronto to Hanlan’s Point, Centre Island, and Ward Island. Named after the flower that is the symbol of Ontario, the Trillium is one of only a few ferry boats that have remained in people’s minds and hearts. The Trillium was chartered to ferry the royal party to the Toronto Island when the Princess of Wales visited Toronto in 1919. No other Toronto boat in service has ever been granted that honour again. Unfortunately for the Trillium, her usefulness as a ferry boat was eroding. With modernization, diesel powered ferry boats were introduced. These new Toronto boats were newer, faster, and better. As a result the Trillium was retired from active service in 1952 and was placed on standby for emergency use. With no emergencies from 1952 – 1957 her days as a ferry boat ended unceremoniously. She was ultimately sold to The Metro Toronto Works Department for $4,200 in 1957. Instead of a ferry boat they were planning to use her as a garbage hauler as they had done with the Bluebell, but instead they just had her towed to one of the island's lagoons and left to rot. The Trillium never disappeared from people’s minds and hearts. There were many rumours about the Trillium being resurrected as a floating restaurant or a museum. But, alas, it was not to be. In 1974 $1 million was dedicated to the complete restoration of the Trillium after tests disclosed that the hull was sound. She has been completely restored to the way she looked in 1910.